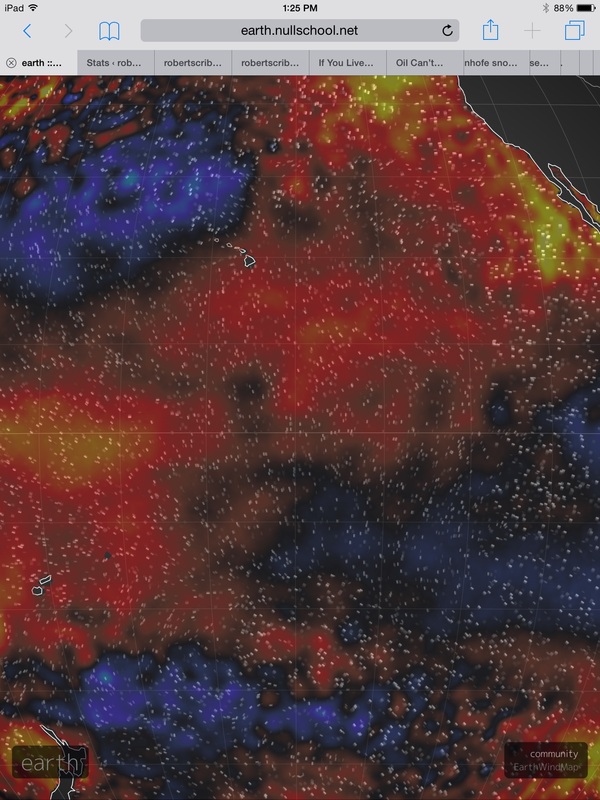 For the past six months, the Pacific Ocean has been very, very warm. A vast and unsettling expanse of record heat building from the tropics on through the mid lattitudes and into the Arctic. Sea surface temperatures across a broad swath of ocean from the equator on north and eastward have consistently measured between 0.5 and 5 degrees Celsius above average. A lazy reverse C pattern of heat stretching from the equator running up along the west coast of North America and then re-curving westward just south of the polar zone. It is a pattern that is indicative of a well developed positive phase Pacific Decadal Oscillation. A kind of pattern that results in very warm sea surface temperatures for much of the Pacific. And a pattern that tends to favor the formation of El Nino. As of December 2014, PDO values had climbed to their highest on record. And with these high sea surface temperature values related to PDO, the Pacific also seemed to be quietly settling into what, at first, appeared to be a mild El Nino. The key value for El Nino is a measurement for sea surface temperatures along a region of the Central Equatorial Pacific known as Nino 3.4. Stretching from about 160 West to 120 West Longitude, this expansive zone of ocean waters below Hawaii tends to warm with the onset of El Nino. The threshold NOAA uses to determine El Nino is a sea surface temperature anomaly for this area of +0.5 degrees C above average. And ever since September of 2014, sea surface temperatures have been hovering above the +0.5 C line. NOAA’s determination for El Nino requires 5 three month average periods in which Nino 3.4 exceeds this mark. And it looks like, so far, four out of five of those periods have met the El Nino requirement. September, October and November (SON) averaged +0.5 C. October, November and December (OND) averaged +0.7 C. And November, December and January (NDJ) averaged +0.7 C. With all weekly measures for February coming in near or above January values, it appears the DJF value will post somewhere near +0.6 C (please see NOAA’s Weekly ENSO Status Report). 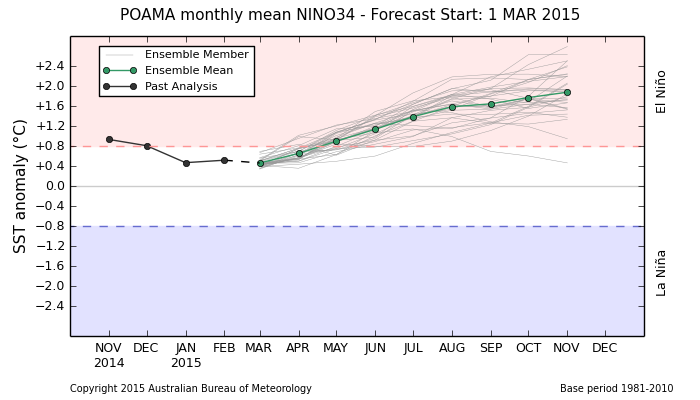 Even if March values dropped to +0.4 C, a weak El Nino would emerge in the Pacific during Spring of 2015. 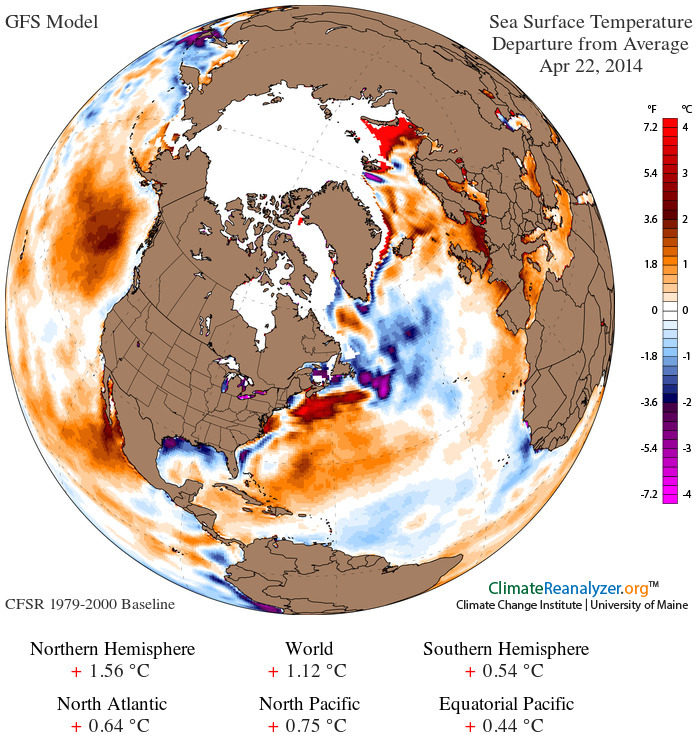 However, sea surface temperatures for this zone are not falling as we enter March. They are instead ramping higher. The Kelvin Wave will slowly rise to the surface, elongate and transfer some of its latent heat to the sea surface and atmosphere. Driving this Kelvin Wave along are west wind backbursts that today were in the range of 25 mph sustained with gusts to 35. These gusts are continuing to drive warm water eastward and downward, providing more energy for the Kelvin Wave as well as any emerging El Nino. A set of winds that could well grow stronger as a weather pattern know as the Madden Julian Oscillation (MJO) is predicted to ramp up, bringing stormy weather and more counter trade wind air flows across the Western Pacific equatorial zone. These combined factors have spurred Australia’s Bureau of Meteorology to post a renewed El Nino Watch. NOAA is also showing a heightened chance for El Nino, with a near 60% probability for the event emerging late winter or early spring. The +1.9 C peak and rising prediction for Nino 3.4 in the above graphic is indicative of a relatively strong El Nino by mid November of this year (for reference, the 1998 Super El Nino peaked at around +2.3 C for this region while 2010 peaked at +1.5 C). But even a far milder El Nino would likely have far-ranging consequences, especially in a world that has been pushed to keep warming and warming by the massive human fossil fuel emission. All that heat again building along the equatorial Pacific would likely shove the Earth’s oceans and atmospheres again above record thresholds. And that would mean that 2014’s record as the hottest year for the Earth’s surface may only stand for but a few seasons more. The risks for another record hot year for 2015 are, therefore, again rising. As of March 5, 2014, NOAA has now officially declared weak El Nino conditions for the Equatorial Pacific. Please see this related discussion LINK.